At Vector & Raster, laser engraving wood is one of our specialities; allowing us to create hundreds of truly unique pieces for businesses large and small. So, to offer you a little inspiration for your next project, let’s take a look at a piece that we completed for one of Melbourne’s thriving cafes and bars, Koffi Bar. When designing this piece, our client chose a material that worked with their aesthetic blend of sophistication and cafe chic. Enter American Oak Veneer; a 15mm thick sandwich of real American Oak and particle board. 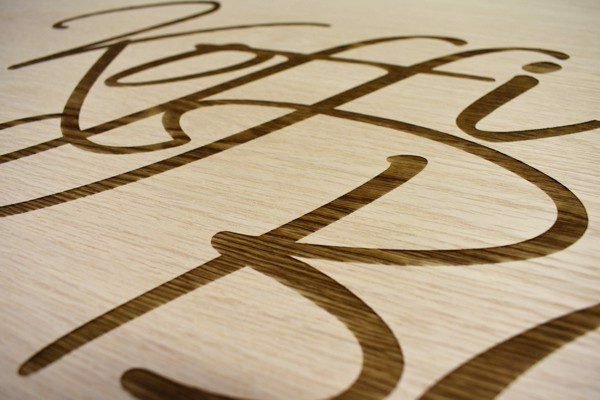 When it comes to laser engraving wood, this material is quite easy to work with. American Oak allows us to get very intricate with our designs without compromising on a clean finish. Laser cutting or engraving wood can always impose a new challenge for each clients needs, and this project was no different. 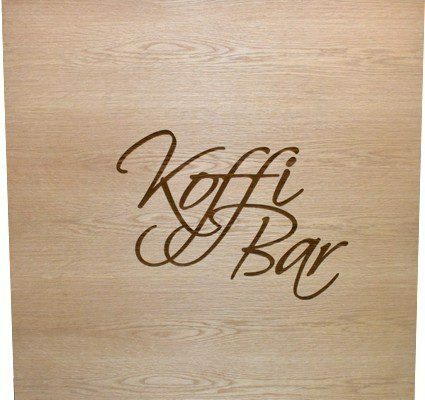 Placement of the Koffi Bar logo was absolutely critical, as one side of the finished piece was going to be trimmed down on an angle before use. As with all jobs, our aim is to produce a quality engraved piece with minimal to no residue, burning, or discolouration to the face of the finished product. It was also vital that we provided the highest possible level of contrast to the engraved areas. As you can see, the close-up of our finished product shows the sharp outlines of its engraved areas. This is a standard we maintain across all our projects. While it can be a challenge on certain projects, Vector & Raster is dedicated to ensuring a quality finish regardless of materials used. There’s something almost ineffably charming that draws people to laser engraved wooden pieces. Pieces made using this process always exhibit a certain warmth. It’s no wonder that they are in-demand with such a wide variety of businesses and uses. These are great for interior signage, labels, name tags, ornaments, POS displays, and a host of other marketing products. As far as engravable materials are concerned, there isn’t a comparison point to the versatility of wooden pieces. Keep that in mind next time you go to your favourite shop. You’re likely to notice at least one instance of laser engraving wood staring you in the face. Are you looking to have some laser engraving, cutting, or etching done for your next project? Vector & Raster is one of Melbourne’s leading laser cutting services, so you can be sure that your laser cutting needs are in the hands of experienced professionals. Contact us today!